But the woman continued to shower for almost an hour. In that time, the man asked again when she’d be out. He wants to give her a religious tract or invite her to his church, Jewel presumed. “Because that’s how God works. He blesses me, so I’ll bless others,” he said and left. When Jewel saw Larry, she couldn’t wait to relate this story. “God was there! God was there!” she exclaimed. Larry obeyed the Spirit’s nudging to listen instead of to speak. A pastor gave a poor man some cash to help him through the difficult time of missing work to be with his sick child. This man shared more than a third of it with a stranger. And God used it to touch a woman indifferent to Christianity. It’s easy to give thanks when you feel thankful. But what happens when God tells you to give thanks for something you resent? Faith is displayed in surprising actions. 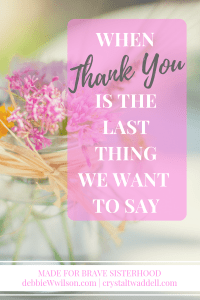 Join me over at Made for Brave Sisterhood with Crystal Twaddell where I talk about a time God asked me to thank Him for something I didn’t want. 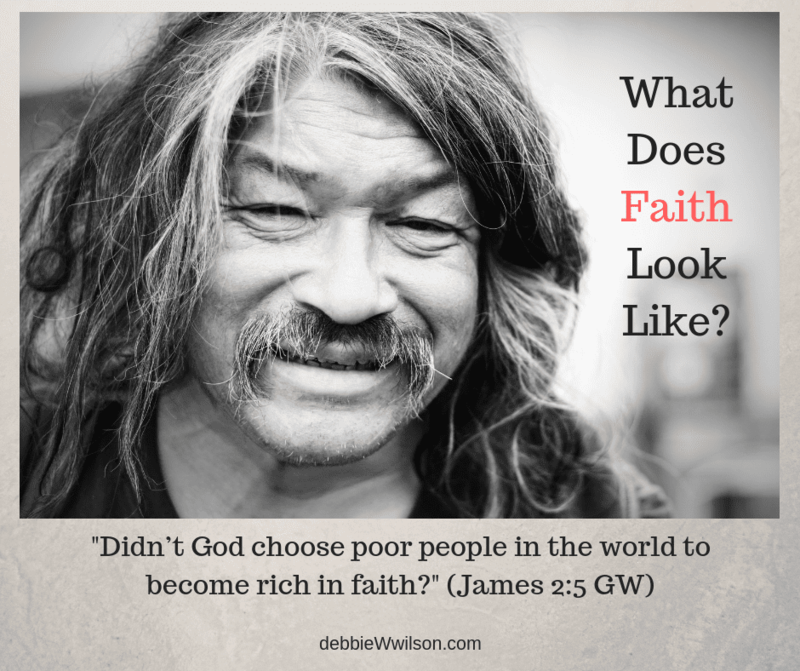 Question: What does faith look like for you? 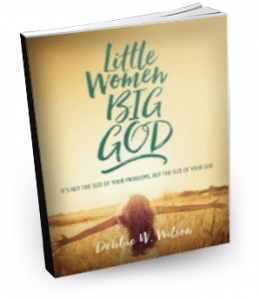 Filed Under: Faith, Life Experiences, Thanksgiving, Trusting God Tagged With: Debbie W. Wilson, Refreshing Faith, What Does Faith Look Like? That is a beautiful story and a perfect illustration of real Christian faith. A lovely reminder of how we are called to live and represent our generous and gracious Savior. Ann, it really moved me when Larry told me about it. Powerful message. Faith, to me, is totally trusting God and knowing His plan is best. I may want answers immediately, but He is working out His plan. I need to be patient. 🙂 I may not feel like giving thanks in tough situations, but giving thanks brings me peace. Melissa, I so agree. Giving thanks brings a peace that surpasses understanding. Excellent! blessed to be a blessing! Thank you, Horace. I love hearing stories of faith too. This one was too good not to pass on. Blessings to you too, my friend. I love this Debbie! 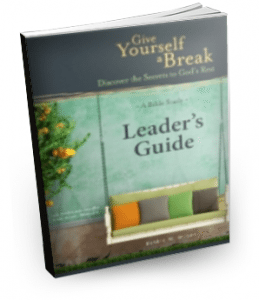 What peace there is in trusting God to reach others through us and even, in spite of our short-sightedness. Thank you for sharing! Love this story, Debbie! Such a good word and reminder of God’s goodness and an example of faith, generosity, selfless giving, etc. Hope you had a great Thanksgiving! We were away traveling for 8 days with family and saw close friends in VA as well, but now trying to catch up in every direction….never like that part of being away. Thank you, Pam. We had a wonderful family time together. I’m glad you could travel and be with yours!